Alemais went into the 2016 draft as a possible first round pick, but his bat didn’t develop as hoped. Scouts considered him one of the best defensive infielders in the draft and he should be able to stick at short. He’s exceptionally athletic and fluid, and has a good arm. Alemais had just decent hitting numbers at Tulane, with a line of 312/361/392 as a sophomore and 311/368/401 as a junior. He showed solid strike zone judgment, with a BB:K ratio of 16:25 and 20:29 in his last two years. He isn’t likely to hit for much power. It’s possible that his hitting was affected by shoulder surgery he had in high school, as he aggravated the shoulder early in his junior year. Alemais has fairly good speed and stole 46 bases in those years. He signed for $68,400 below the slot amount. As the regular shortstop at Morgantown, Alemais played often spectacular defense, thanks to exceptional balance and agility. His hitting was another story. He made consistent contact, but seldom walked and hit for little power. He did start turning it on late in the season, when a string of six consecutive multi-hit games left him with a .421 average over his last nine games at Morgantown. The Pirates promoted Alemais to West Virginia in mid-August when the shortstop there, Alfredo Reyes, got hurt. 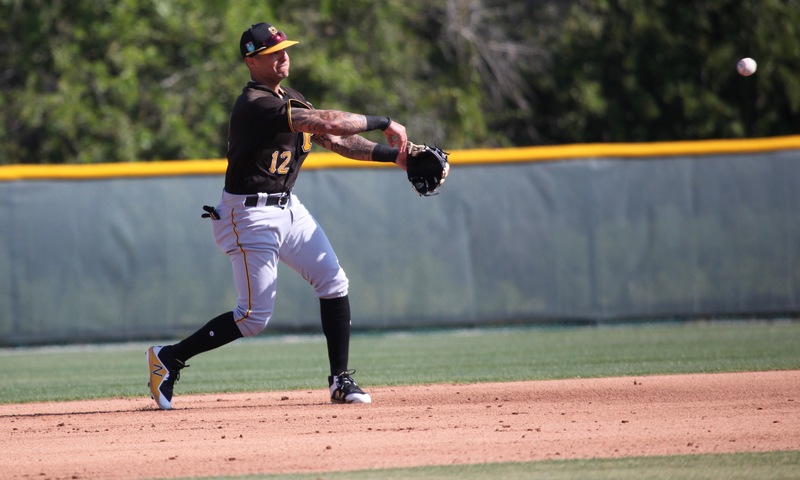 With Kevin Newman in AA and Cole Tucker in Bradenton, the Pirates’ original plan was to have Alemais and Adrian Valerio share the middle infield duties at West Virginia. If not for the players ahead of him, Alemais probably would have gone to Bradenton intsead. When Valerio broke his hand during spring training, though, Alemais simply became the starting shortstop for the Power. Shortly after Valerio returned, Alemais tore a ligament in his thumb making a tag and required surgery. He was out from mid-May until early July. Two weeks after he returned, the Pirates promoted Newman and Tucker, and moved Alemais up to Bradenton. Alemais’ performance at the plate between the two stops was a study in contrast. At West Virginia, he seemingly tried to hit for power and the result was terrible plate discipline and a low average, along with only modest power. At Bradenton, he toned down his approach and hit much better, with very good walk and K rates. The Pirates had a shortstop logjam at the upper levels, with Adrian Valerio headed to Bradenton and Cole Tucker at Altoona. The Pirates dealt with the problem by installing Alemais at second base with the Curve. He was there all year and was voted the Eastern League’s best defensive second baseman. At the plate, he continued the toned down approach of the previous year. He hit for a decent average, maintained a good walk rate and didn’t strike out very much, but hit for very little power. He had a big platoon split, posting an .817 OPS against LHPs and .654 against RHPs. Alemais will return to Altoona in 2019, although that at least will allow him to move back to short. He has the defensive ability to make the majors at least as a backup, but he’ll need to produce something at the plate. June 10, 2016: Drafted by the Pittsburgh Pirates in the 3rd round, 105th overall pick; signed on June 16.